PopBin designed by Andrea Santamarina is the first product we produced. We launched a first edition of 150 handmade units. All products are made in collaboration with the prisoners of the carpenters workshop in Dueñas Prision (Palencia, Spain), to reintroduce them to a working environment. We are committed to create playful products with local materials and companies to promote responsible design. Presentation at: The Spanish Film Institute (Cine Doré designed by Javier Feduchi). The goal was to create a surprise effect on consumers introducing an object from the film industry into another atmosphere (the workspace) with a different function. Create an original, playful and practical wastepaper basket establishing an original visual association between two containers: a popcorn box and a wastepaper basket full of crumpled sheets. Its irregular shape also reminds to a boat bow and makes easier its transport. Pop-bin can be placed on the floor and in a wall corner using its handle and can contains different things (plants, magazines, clothes, toys…). The large size bin can also be used as a laundry basket. 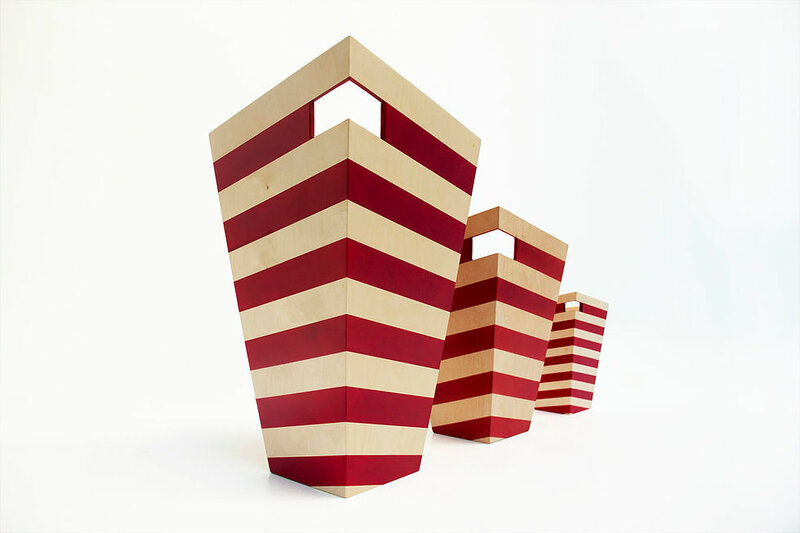 Pop-bin is made from birch wood using color water varnish and is avaliable in 3 different sizes. Price upon request. Get in touch here.